The risk-based licensing system supports the EPA's regulatory framework. Risk-based licensing aims to ensure that all environment protection licensees receive an appropriate level of regulation based on the environmental risk of the activity. 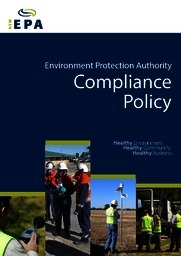 The EPA's Compliance Policy provides details on the EPA's regulatory approach. There is no 'one-size-fits-all' response to non-compliance and the choice of regulatory action depends on the issue, context and actual or potential environmental impact. When compliance monitoring identifies non-compliance, its significance is evaluated to determine the most appropriate response to take. 'Significance' involves establishing the level of risk posed to the environment or impact as a result of non-compliance. Once the level of risk has been established, the environmental non-compliance is allocated a 'significance level' of high, moderate or low. A regulatory response is undertaken that is proportionate to the seriousness of the environmental issue. Other factors, such as the licensee's record of compliance are also considered when determining an appropriate regulatory response. Any action taken by the EPA aims to ensure that environmental impacts are minimised, contained or made good. The Environmental Management Calculation Protocol is used to determine a licensee's environmental management category and allocates environmental weightings to regulatory actions undertaken by the EPA proportionate to the seriousness of the environmental issue. The EPA has developed a set of guidelines to assist the general public and licensees to understand the factors that the EPA considers when undertaking licensing functions under the Protection of the Environment Operations Act 1997 (POEO Act). In particular, these guidelines outline general considerations in response to environmental issues or non-compliance with licence conditions at licensed premises. environmental systems, practices and improvements (PDF 490KB). The guidelines also include case studies where regulatory actions are new, complex or where there is no existing EPA guidance available. Where existing guidance is available for regulatory actions a link to the appropriate guidelines has been provided.